My real job has been keeping me very busy lately and inbetween I am working away to get the house decorated for the holidays. I’m not sure of the final count yet, but I think I am up to 10 or 11 trees this year! I love it! I have also been trying to get some of my projects done for my etsy shop and for my eBay store. At my last trip to the Big Flea outside of Washington, DC I picked up a bunch of pretty vintage jewelry. My BFF and partner in crime Beth gave me a lovely vintage round piece of mirror and I put it all together to create this pretty piece. I love how it turned out. If I hadn’t already made this one for myself I would absolutely have to keep this. But mr. georgiapeachez won’t tolerate two of this girly items hanging around so I will put this one in my Etsy shop. sigh. 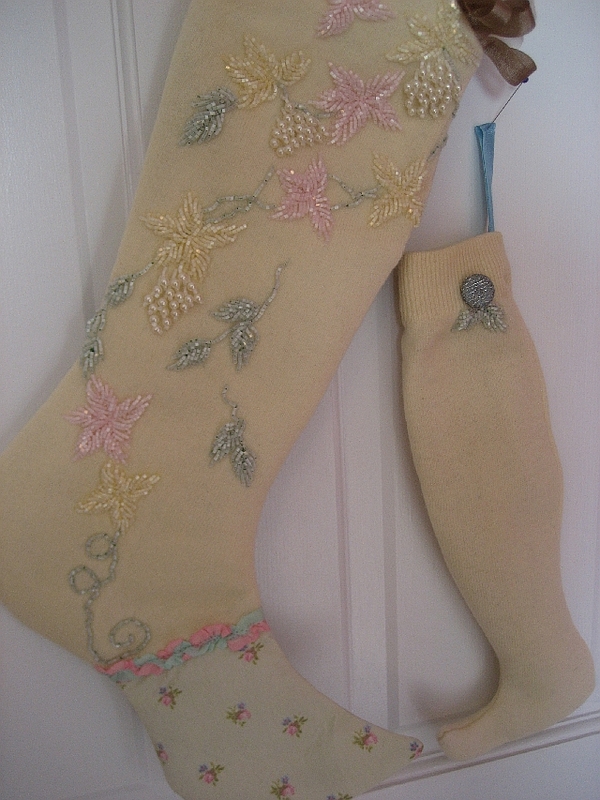 I recently made a pretty christmas stocking for my good friend Susan from a vintage beaded cardigan. I got that idea from some stockings that were in last year’s issue of Country Home Christmas. I made two more stockings from that cardigan. I have put them in my Etsy store too. These were fun to make and I will be on the prowl for more of these vintage cardigans that need some TLC and would enjoy a second life. OK, only two trees left to decorate so I will get busy with that and start taking some pictures of them so that I can share. those are all so cute! love ’em! I can’t imagine doing half of what you do and I don’t even have a real job! Have you discovered an extra 10 hours a day that the rest of us aren’t privy to? Thank God for Google reader or I’d have missed that mirror for sure. I ADORE it and am so glad to have bought it! Your mirrors are beautiful! I can certainly see how much time and work went into that project! The stockings are sooo cute! That mirror has left me speechless – it is just divine! You have an incredible talent, I do love visiting your blog. That mirror is GOOOORRRRGEOUS!!!! Looove it! The colors are so yummy!!! Just really a beautiful job, love all the jewelry and how you put it together, whoever gets it is so lucky! Oh My Oh My, what a lucky girl your friend is. Those stockings are gorgeous! what an awesome blog! glad i found it! Oh Wow! Those are stunning, really pretty! 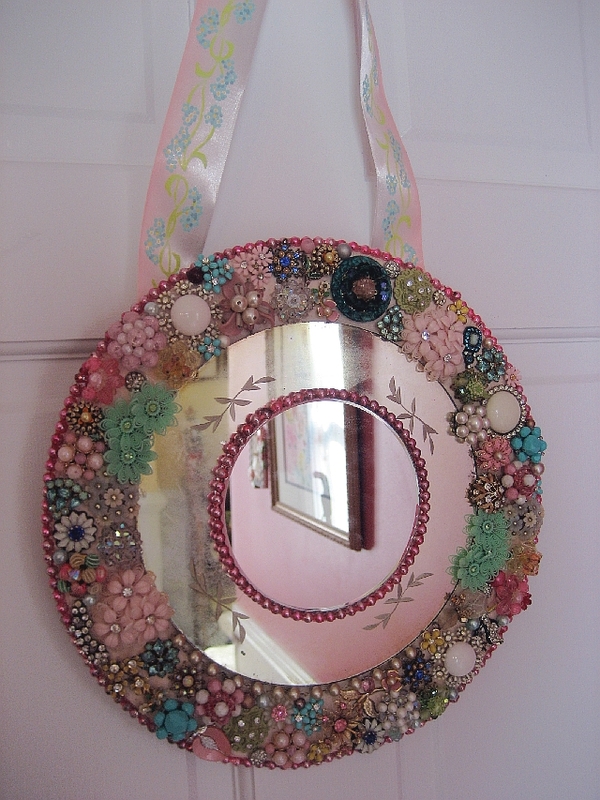 What a stunningly beautiful mirror – I don’t know how you have managed to part with it! The new owner is very lucky! 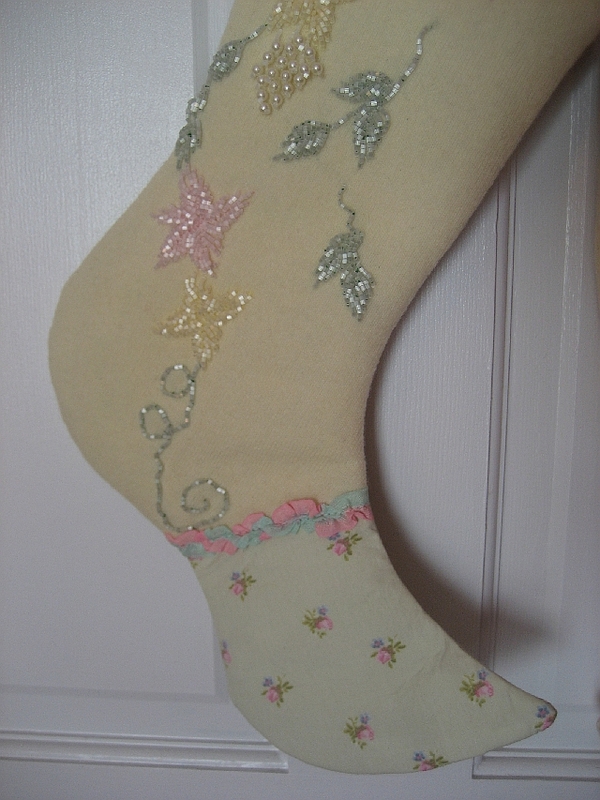 The Christmas stockings are adorable too. Wow, I’m so behind. Google reader just greeted me with 300 unread posts. Work has kept me off the computer. I love the stockings and the mirror. When I catch up, I’ll be featuring your case in the next day or so. My daughter accidentally spilled cocoa on it and thankfully the case protected my mac – (another selling point for sure!) I managed to get the cocoa out – yeah! I’ll be in touch! 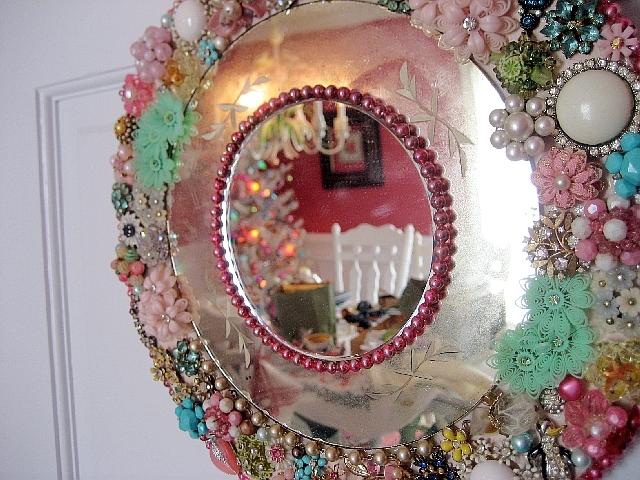 That bejeweled mirror is amazing! Simply gorgeous. OMG Suzy, both pieces are gorgeous, love the mirror and the stocking is pretty!!!! oh Oh OH!!! i am dying over that GORGEOUS mirror!!! wow weeeeee!!! how wonderful!!! I LOVE these creations of yours!!! The mirror is gorgeous…. and those stockings!?!?!?! Just beautiful! The mirror and stockings are just beautiful!!! Love all the pretty beads in the stockings. Just beautiful. No wonder I couldn’t find any vinatge jewelry I wanted to buy (just to wear) at The Big Flea. You beat me to all the good stuff! Gorgeous re-use. I love it. I love the mirror and your blog!